The output app created by FlipBook Creator for MAC can be viewed on iPad or iPhone? Many people email me to ask whether the output apps can be viewed on iPad or iPhone. I guess it must be a matter of misunderstanding. FlipBook Creator for MAC support 2 output type: HTML for online publishing and .app for offline transmitting. The latter is specific for MAC computer. That is to say, as an executable application, it just can be installed on MAC. Even though, iPad and iPhone are produced by Apply Co, the output app can’t be installed on them for they have different operation systems. But you would be interested in can FlipBook Creator for MAC generate flipbook which can be viewed on iPad and iPhone or Android devices. In fact, the PC version of FlipBook Creator or other products have supported this function. Fortunately, in the near future, MAC version flipbook creator will support the mobile flipping book viewing also. Let’s create an app for MAC computer to explain it well. 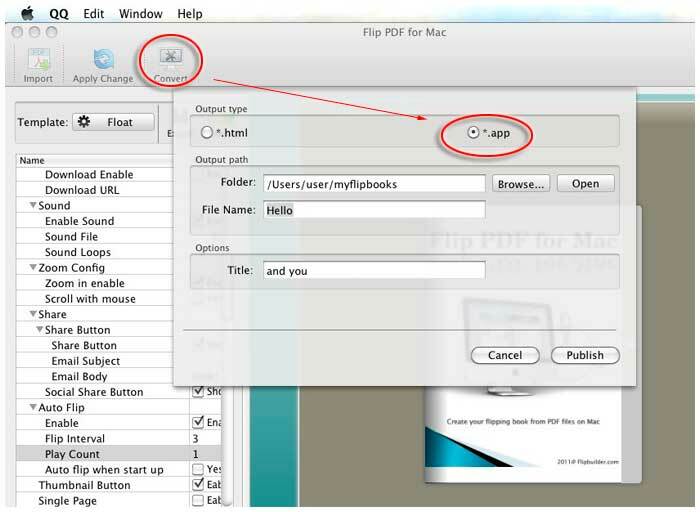 Step1: Launch FlipBook Creator for MAC, and then import a PDF file from your local disk that you have prepared. Step2: Don’t forget setting to make it look better. Step3: click the top icon of Convert and then check the afterward checkbox of *.app. Finally, install the output app file on your MAC computer. In fact, if you try to install it on iPad and iPad, it must be failing.